Our blog had it's first birthday yesterday and the website turned one this morning. What an adventure this has been. Exactly one year ago today I was the keynote speaker at the Fourth Annual Ojai Lavender Festival. This years festival is scheduled for June 28th. The website and blog are dynamic, works in progress at all times. A myriad of updates and projects will be unveiled soon, in perfect timing. I find that I start working on one thing and then spirit sends in a curve ball that requires immediate attention, thus the item that was of primary focus gets moved to the side. This type of dynamic activity, like our weather patterns, has become the standard mode of operation. I have noticed that over the past year I have been drawing and painting less. With this realization and Comic Con on the horizon I have begun drawing everyday. A blog devoted to my visual works is also underway. The latest addition to the Illuminated Perfume website is that our shopping cart is now functional! My favorite feature is that shoppers can now choose their three samples from pull down menus for their sampler pack. In the studio we are finalizing custom perfume samples and perfumes, working on the second edition of Chaparral and developing new accords for upcoming botanical perfumes. 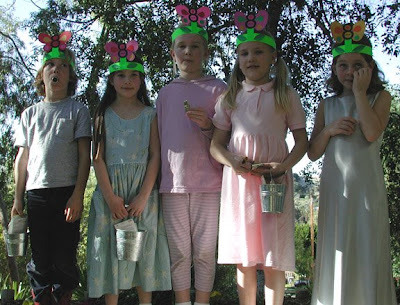 The image above is of my daughter Eve (second from Left) with her buddies at her eighth birthday party. Happy Illuminated Perfume Blog Birthday. Let us know about your Visual Work Blog. Thank you for the birthday wishes, hard to believe it's been one whole year! Yes, I promise to let everyone know once the art blog gets it's first post. Sometimes I think I must be crazy to add yet more tasks to my overflowing plate of creative endeavors. Ah, the life of an artist.